people. It gives right to the people to receive adequate quantity of food grains at affordable prices. The Food Security Bill has special focus on the needs of poorest of the poor, women and children. 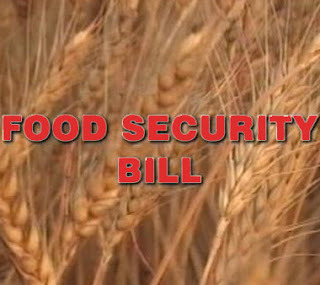 In case of non-supply of food grains now people will get Food Security Allowance. The bill provides for grievance redressal mechanism and penalty for non compliance by public servant or authority. Other features of the Bill are as follows. Upto 75% of the rural population and upto 50% of the urban population will have uniform entitlement of 5 kg food grains per month at highly subsidized prices of Rs. 3, Rs. 2, Rs. 1 per kg. for rice, wheat, coarse grains respectively . It will entitle about two thirds of our 1.2 billion populations to subsidized food grains under the Targeted Public Distribution System (TPDS. The poorest of poor households would continue to receive 35 Kg food grains per household per month under Antyodaya Anna Yajna at subsidized prices of Rs 3, Rs 2 and Rs 1. It is also proposed to protect the existing allocation of food grains to the States/Uts, subject to it being restricted to average annual offtake during last three years. There is a special focus on nutritional support to women and children. Pregnant women and lactating mothers, besides being entitled to nutritious meals as per the prescribed nutritional norms will also receive maternity benefit of at least of Rs. 6000/-. Children in the age group of 6 months to 14 years will be entitled to take home ration or hot cooked food as per prescribed nutritional norms. The Central Government will provide funds to States/UTs in case of short supply of food grains from Central pool, In case of non-supply of food grains or meals to entitled persons, the concerned State/UT Governments will be required to provide such food security allowance as may be prescribed by the Central Government to the beneficiaries. In order to address the concern of the States regarding additional financial burden, Central Government will provide assistance to the States towards cost of intra-State transportation, handling of food grains and FPS dealers’ margin, for which norms will be developed. This will ensure timely transportation and efficient handling of food grains. 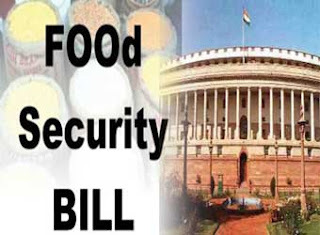 The Bill also contains provisions for reforms in PDS through doorstep delivery of food grains, application of information and communication technology (ICT) including end to end computerization, leveraging ‘Aadhaar’ for unique identification of beneficiaries, diversification of commodities under TPDS etc for effective implementation of the Food Security Act. Some of these reforms are already underway. Eldest woman of eighteen years of age or above will be head of the household for issue of ration card, and if not available, the eldest male member is to be the head of the household. There will be state and district level redressal mechanism with designated officers. The States will be allowed to use the existing machinery for District Grievance Redressal Officer (DGRO), State Food Commission, if they so desire, to save expenditure on establishment of new redressal set up. Redressal mechanism may also include call centers, helpline etc. Provisions have also been made for disclosure of records relating to PDS, social audits and setting up of Vigilance Committees in order to ensure transparency and accountability. The Bill provides for penalty to be imposed on public servants or authority, if found guilty of failing to comply with the relief recommended by the District Grievance Redressal Officer (DGRO). At the proposed coverage of entitlement, total estimated annual food grains requirement is 612.3 lakhs tons and corresponding estimated food subsidy for 2013-14 costs is about Rs.1,24,724 crore.